Pay the same bill amount every month, regardless of changes in weather or natural gas prices. It’s a weatherproof plan designed for peace of mind. Eligibility for the Guaranteed Bill plan and the actual Guaranteed Bill amount are subject to a credit approval process. The estimate is valid only for the specified address at the time of request and is subject to change. We are unable to provide an estimate at this time for the address you provided. Please call us at 888.211.9062 so we can assist you with a quote. 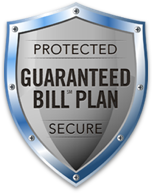 *All quoted Guaranteed Bill amounts are estimates, and eligibility for Guaranteed Bill plans and the actual Guaranteed Bill amounts are subject to the credit approval process. All Guaranteed Bill estimates are valid only for the specified address at the time of this request and subject to change. Pay the same monthly bill amount for total peace of mind. A monthly bill amount that won't change, regardless of changes in natural gas rates or weather, even in winter. This isn't your typical budget billing or levelized plan where you run the risk of getting hit with a hefty bill if you use more gas than expected in the cold weather. With our Guaranteed Bill plan there is no settlement or deferred amount to pay at the end of your plan term. It’s simply a great way to control your natural gas costs with no surprises. How is it different from other bill options? Some providers offer “budget billing,” but if you use more gas than expected, they’ll typically charge you the difference at the end of the year. With Guaranteed Bill, you pay a flat monthly amount and there’s no deferred payment at the end of your plan term. That means you pay the same flat bill amount for 12 months. How does it compare to other plans? Some people confuse "Fixed Price" plans with the "Guaranteed Bill" plan. The primary difference is that with a fixed price plan only the rate, or price per therm, is fixed. That means your monthly bill amount will fluctuate as your gas usage does. This generally causes winter bills to spike during cold weather months. The price per therm on a variable price plan may change or stay the same each month, and customers on these plans may also endure a spike on their wintertime bills due to higher gas usage or potentially higher prices. Guaranteed Bill is a flat monthly bill amount tailored to your premises. It provides you with security and protection against potentially increasing gas bills when the weather turns cold. You won’t have to worry about fluctuations in natural gas prices either. We take the total amount and divide by 12 to determine your Guaranteed Bill amount. Your Guaranteed Bill amount does not include taxes or one-time charges such as connection charges or late fees. GNG will prorate the Guaranteed Bill Charge for non-standard service periods (those fewer than 27 days or longer than 33 days). If you are already a Guaranteed Bill Customer and wish to know what your early termination charge is, please refer to the disclosures included in your welcome package, or call GNG Customer Care.